Magnetic Resonance Imaging (MRI) can be a very helpful tool at diagnosing many problems ranging from orthopedic to neurological to breast. However, as a patient, you want to be sure that the MRI is necessary and helpful to your situation. The opposite may also be true; your doctor may not order an MRI and you feel they should. As patients become more responsible for their health care, asking your doctor these three questions can help make you feel comfortable with the recommendations made for your care. Why do you think this is the best test for me? This is a great question to ask whenever your doctor recommends any test, and particularly if you are paying for it! While you never want to forgo any procedure that can benefit your health, it is beneficial to have information on what would happen if you did. 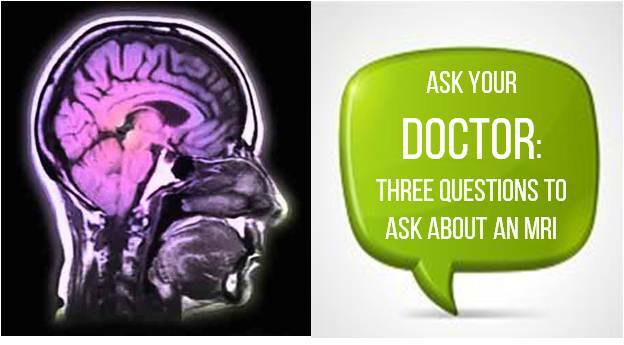 If your doctor recommends an MRI, ask them “What happens if I don’t get the MRI?” Be prepared that their answer may not be definitive since the nature of an MRI is for diagnosis. Here is a scenario for consideration: Let’s say, you are experiencing pain in your hip and your doctor recommends an MRI. If you question what will happen if you don’t get the MRI, your doctor may answer that your pain would continue but he would recommend physical therapy (PT) in the meantime. At that point, you would have to consider how much PT would help and understand that you still may end up getting the recommended MRI anyway. You’d also want to consider how much PT sessions would cost and how many. Understand that asking one question will likely lead to many others, but it will always help you to be more informed about your healthcare choices.